It's strange when your reality is entirely reshaped in someone else's imagination. This is case in Yoshinora Niwa's first UK exhibition 'Historically Historic Historical History of Communism' at Edel Assanti. Niwa's video work documents social interventions in which he grapples to secure an understanding of communism. What remains, however, is a synthesis of learned information, bombastically framed by the harsh fallout of communism. In the downstairs project space a projection shows a man lifted up above a group of men in dark clothing, huddled in a close circle with their backs to the viewer. The man is thrown up into the air - the viewer an unwitting participant within the absurd occasion. The title, 'Tossing socialists in the air in Romania' (2010) offers little in the way of clarification, save the fact that one is compelled to find out why. The video shows Niwa conduct an interview with the president of the Romanian Communist Party, cut with found footage of the revolution twenty-one years earlier. Niwa navigates the president's stern convictions with a faux-naivety interspersed with quick-fire questions that cut through hard-set indoctrination claims such as, "Christ was the first communist in the world". Niwa grins and whispers "really?" to the translator, after which the artist invites him to the 'socialist tossing'. He declines. "It is obvious that I have no experience or memory of the Revolutions and the collapse of the Berlin Wall, but somehow I have memories of those events as if I had re-experienced them. Maybe I have 'experienced' them many times via mass media and books, and created fake memories". Niwa's comment is a compelling response to memory-making, and, as if the viewer is also experiencing these 'fake memories', there is a twisting of the information; a blurring of image and memory. 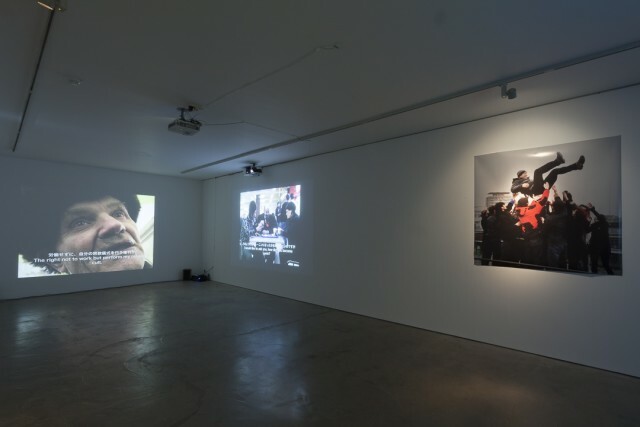 In 'Looking for Vladimir Lenin at Moscow apartments' (2012), three projections surround the room. In the videos Niwa is seen travelling through Moscow during the Russian presidential election of 2012. Stopping strangers at random he asks if he can borrow something from them related to Lenin. Responses are varied, summoning everything from cheerful nostalgia to aggressive revulsion. After visiting willing participants' homes, Niwa was able to collect one-hundred and fifty portraits, photographs and propaganda pieces including posters, flags and badges featuring Lenin. These were displayed alongside the film when it was shown at the Moscow Museum of Modern Art. What becomes apparent through the films and the exhibition as a whole, is the collision of an interpretation of communism by Niwa, as opposed to those who experienced it first-hand. Niwa's role as researcher, aided by information drawn upon through texts and popular cultural references, is amplified by his curiosity. Niwa's approach to educating himself relates to wider global concerns. His jokey, off the-cuff-attitude is commonplace - not because of intolerance or ignorance but because of the way we are shaped by secondary sources rather than facts. This becomes clear through the artist's unorthodox requests and interventions, which one feels that, despite moving toward understanding, will always fall short.